A scenic photo taken of a beautiful landscape scene with green grass, blue sky, close up wild flowers, and yellow flowers in Marin County, California. Marin County is just north of San Francisco. From 1850 to 1950 the population of Marin increased by 85,000 people. Twenty years later there were an additional 123,000 residents. Population growth has slowed since then and is now about 245,000. In 1972 the Golden Gate National Recreational Area was created which encompasses the Marin Headlands, Muir Woods and thousands of acres along the Pacific Coast. 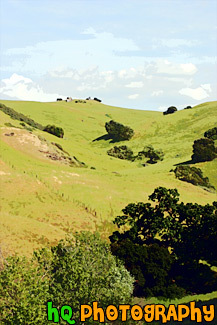 Scenic picture of the green hills of San Jose during February of 2005. This picture was taken at a spot on the east San Jose hills just north of the Evergreen area. The hills are especially green right now in February because of the tremendous rainfall the bay area has experienced this season. The rain has made for a some beautiful green hills surrounding San Jose, California. 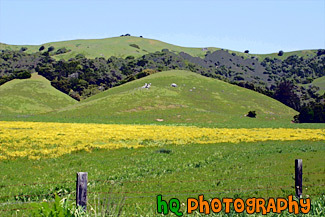 A scenic photo taken of a beautiful landscape scene with green grass, blue sky, and yellow flowers in Marin County, California. Marin County is just north of San Francisco. From 1850 to 1950 the population of Marin increased by 85,000 people. Twenty years later there were an additional 123,000 residents. Population growth has slowed since then and is now about 245,000. In 1972 the Golden Gate National Recreational Area was created which encompasses the Marin Headlands, Muir Woods and thousands of acres along the Pacific Coast. 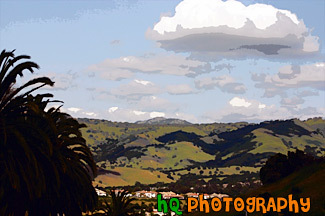 Rolling hills of Palo Alto, California on a sunny day. 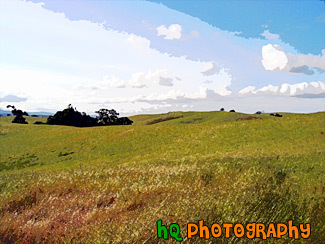 This photo was taken on the eastern hills between Palo Alto and Los Altos in the Bay Area. 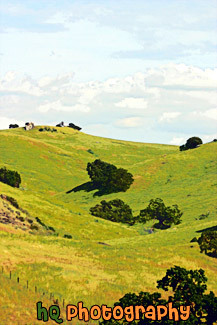 A scenic picture taken of a landscape scene in the East San Jose area near Evergreen Village. This picture was taken on a beautiful day with scattered clouds and blue sky. You can see the green hills from much rain this year in the background with shadows from the clouds over them. A scenic picture taken of a bunch of black and white spotted cows located on a big green hill along the coast at Kehoe Beach in Marin County California. 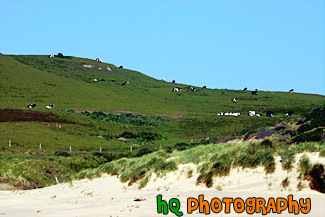 In this picture you can see where the beach starts as the sand approaches the grass in the foreground. 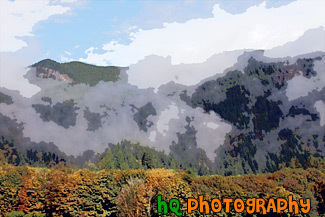 A scenic picture taken of foggy hills near the entrance to the North Cascades National Park located in Washington State. In this picture you can see the fall colors starting to change on the trees and blue sky seen above. A scenic picture and contrast between a very green hill and partly cloudy blue skies. 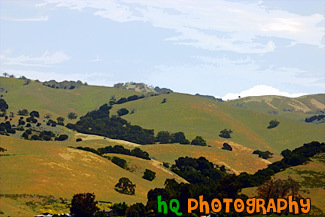 This picture was taken in San Jose of the very green hills (which are starting to turn brown) from the tremendous early 2005 rainfall. 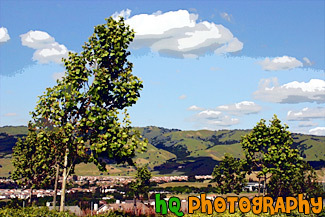 A scenic picture taken of a green hill filled with lots of green trees on a blue sky sunny day in East San Jose, California. 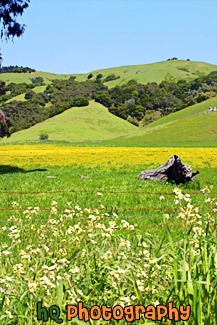 A scenic picture taken of a green hill, green trees, and yellow wildflowers blooming during spring in Northern California. This picture was taken in the East San Jose area. A scenic picture taken of a lake in the foreground, green rolling hills in the mid-ground, and interesting puffy white clouds and blue sky in the sky. 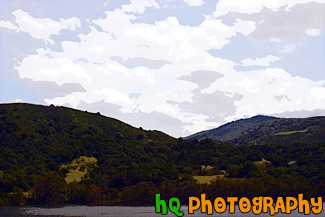 This photo was taken near the Santa Cruz Mountains on the way to Santa Cruz, California near Highway 17. 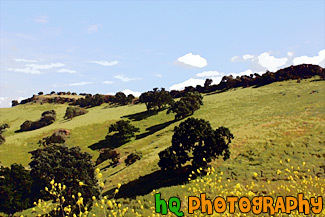 A scenic picture taken close up of one of the many rolling hills located in the San Jose Bay Area in California. In this picture you can see green hills with trees scattered over them on a sunny day. 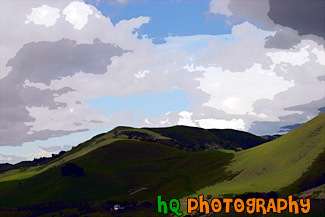 A scenic picture taken of some green hills with the shadows of the clouds on the hills from the partly cloudy sky. This picture was taken in South/East San Jose near the Silver Creek Valley area. 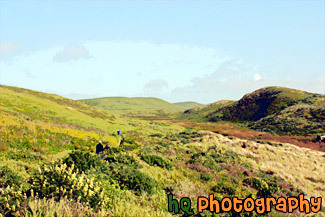 A scenic picture of people hiking on a trail near the coast at Kehoe Beach which is located in Marin County California. This is a beautiful picture as you can see the green hills and wildflowers of marin county along with some patchy fog in the background with the blue sky.